air intake filtration a challenge. Every piece of equipment, large or small, stationary or mobile, indoors or outdoors, needs preventative maintenance. Dirt, debris and grease are continually coating and insulating your equipment's coils, condensers, electronic systems, motors, fins and other components that fall in the path of the equipment's air intake. 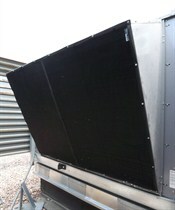 Airflow obstructions or any kind are a costly expense. Even if foreign objects are not visible, the buildup of airborne dirt will impact the equipment's ability to work efficiently and require repeated maintenance for cleaning. Dirty equipment means efficiency decreases, heat build-ups, higher discharge pressure and increased amp draw. Forced to run for longer cycle times, at reduced capacity, the equipment eventually breaks down, life expectancy decreases and power costs escalate. Permatron's patented equipment protection filters are made of permanent, washable synthetic fabric media, which draws in and traps airborne particulates. The filters are available with either 3-dimensional electrostatic polypropylene media or PVC coated polyester high abrasion media. 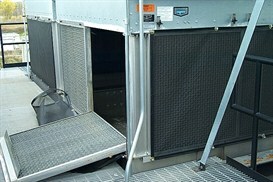 Enhanced by airflow and custom fit, the filters need no electrical connection or system modifications. Well-maintained equipment costs less to operate, ensures optimal life expectancy and energy efficiency. Ensuring that your equipment delivers consistent high-level performance alleviates the need for unnecessary service calls and warranty claims.